Respiratory Challenges – Glass Half Full with Leslie Krongold, Ed.D. You know when you have a progressive disease sometimes it seems like the next step — the new normal — is dramatic? It seems to come out of nowhere…whether it’s your mobility, your energy, breathing capacity, or any of the myriad of bodily functions that can decline. Well, I’m there with respiratory weakness. Yet it didn’t really happen overnight. 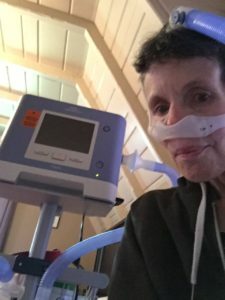 I can recall 10 or so years ago going to my annual visit at the Muscular Dystrophy Association Care Clinic and, after taking a rather simplistic diagnostic test, being told by the nurse that my breathing capacity was at 70%. I don’t think I took it seriously because the diagnostic device was rudimentary and I felt healthy. A year or so ago I was supplied with a ventilator for night time use. The whole experience freaked me out and I couldn’t handle the forced air. I would sit with it for ~ 15-minutes and then stop. After a month or so I tried to take a nap with it. I couldn’t handle it. Long story short, I ended up returning the device. I told myself the pulmonologist was moving too fast…like installing an outdoor ramp over stairs when you’re still ambulatory. This past winter was a difficult one for me — one respiratory issue after another and I didn’t seem to have a full recovery. 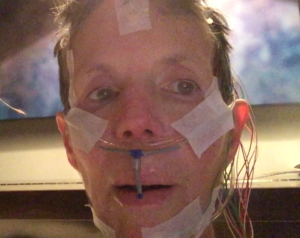 I’m with a different healthcare provider now and went to see a new pulmonologist who scheduled me for a sleep study. It took a couple of reschedules on my part because I was in denial of what I must have known was the inevitable. This brief phone conversation set off a period of depression. I was not operating with a glass half full perspective. Thankfully my pulmonologist led me to what I thought was another pulmonologist colleague of hers but he is actually a Critical Care doctor. After our first meeting my spirit lifted. He is listening to me and really understands that I need to gradually ramp up to the optimal settings. These adjustments to a progressive disease — a new normal — are difficult physically and emotionally. I’m grateful to be working with a physician that gets it. I’m also grateful for two Facebook groups — one specifically for adults with myotonic dystrophy and the other for breathing issues related to having a neuromuscular disease. I’ve learned valuable information and received support from these cohorts. So far I’ve acclimated to one air pressure setting increase and using the humidifier. I also fell asleep twice with both on. Small steps. That’s what I can handle. I’m feeling hopeful. So glad your pulmonologist directed you to a doctor with compassionate care along with expertise – someone capable of working with you to find the best next steps. I have sleep apnea, asthma, and chronic bronchitis. I can relate to your struggle with fine-tuning the settings and to unhelpful, rude professionals. I’m glad you’ve finally found what you need. Hello Leslie, Thanks for sharing this information about respiratory challenges. This information helps me a lot.